For years, skiers and riders have been forced to make a tough decision: ski and ride the world class steeps, glades and groomers of Squaw Valley, or choose the down-home vibe and powder-filled bowls of Alpine Meadows. But what if you didn’t have to make that decision? What if you could explore the wide range of terrain that both mountains offer without having to choose one over the other? That dream is now closer than ever to becoming a reality. 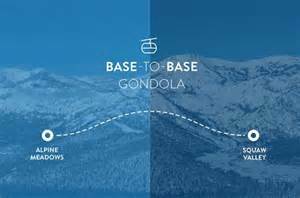 Squaw Valley | Alpine Meadows is excited to announce plans to create a base-to-base gondola connecting Squaw Valley and Alpine Meadows.